More than 110 countries have undertaken or are contemplating PPP programmes, however a comparatively low proportion of these have actually succeeded. All countries looking at doing PPP are in competition for a limited international pool of advisers, capital and operators. There are many examples worldwide, even in successful economies, where projects have been stalled when impediments to successful PPP implementation have been discovered and this can have serious effects on the ability of the country to attract both investors and funders for future projects. Bidding for major infrastructure projects is expensive for the private sector and any doubt as to the readiness of the country to deliver the project seriously reduces the private sectors appetite to bid. 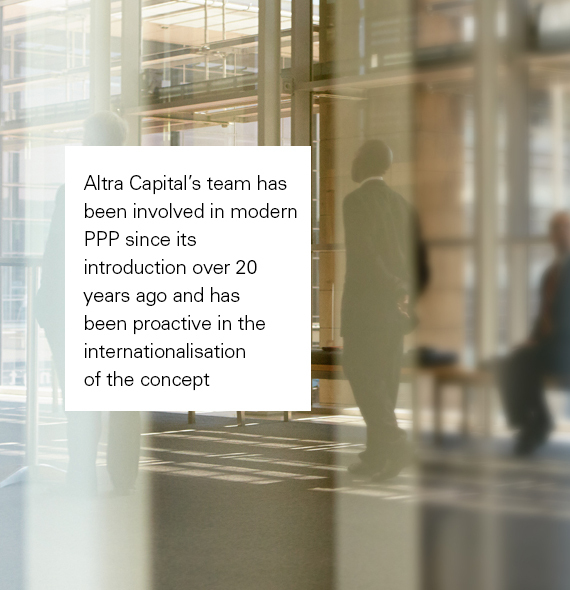 Altra Capital is at the forefront of PPP development and promotion of the knowledge required by those involved in them. Altra Capital’s PPP programmes have formed a vital part in building capacity within many countries. They draw on our experience devising and implementing PPP strategies internationally, providing insight into reasoning behind the theory and exploring ways that PPPs can be successfully adapted to new situations.